Two hearts beat as one in this beautiful pendant, custom-made for you in two tones of gold. 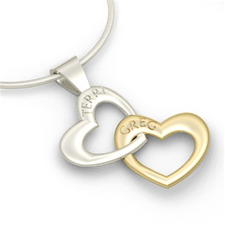 Personalized with the names of a special couple, the entwined hearts are forever linked. Add the date of a memorable occasion, if you like.